It was AIDS and the need for education that made the people of Kabubbu choose Geraldine and Geoff Booker as their benefactors. Nothing could have been further from the minds of this couple. They came to Uganda to visit friends, who brought them to the village, perhaps to find a child to sponsor. Since then, they have stumbled from one task to another and watched in wonder as the project grows from tiny seeds of hope and faith; not only their faith, but that of the villagers in equal measure; a mutual quickening. And so the Quicken Trust came into being. I am a witness to what has happened here, and I am amazed. My experience with hospitals in the past has been limited to family accidents, the occasional removal of internal organs such as tonsils and appendix, and having my children. It is with a sense of the unknown, and no little trepidation, that I set out to spend an anti-natal day at the Kabubbu Health Centre, built in 2004. Dennis talks me through HIV. It is a virus which evolves into AIDS when infections start. TB is another trigger. Blood tests determine the levels of white cells. If they fall below 500, then the patient is issued with free retro-virus tablets. Dennis’s story is similar to that of other Kabubbu volunteers who after a trial period may – or may not – be offered a job. 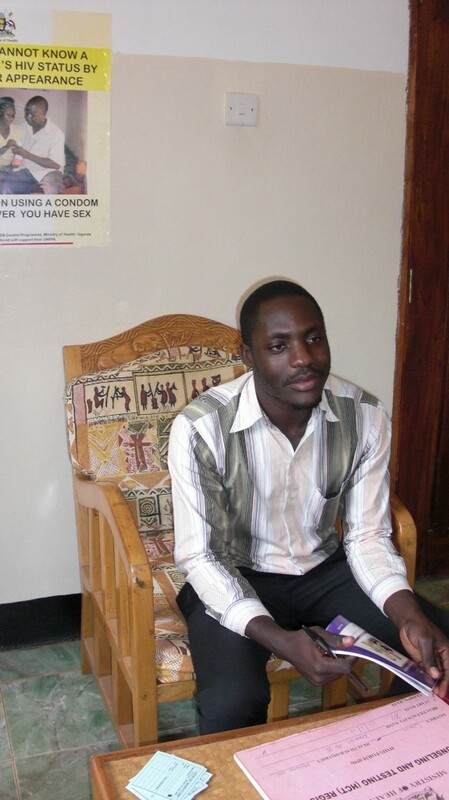 A gentle, soft-spoken counsellor, he graduated at Makerere University in Kampala in clinical medicine. He couldn’t get a job elsewhere, so volunteered at Kabubbu Development Project (KDP) for six months in 2011. Then KDP assisted him with expenses for one year, before finally offering him a full time job. We wade through a dozen files as I help him input the daily patient records onto computer. Then he passes me on to the ante-natal clinic in a spacious shaded area outside. There is an air of quiet resignation over the rows of expectant mothers as they come up to the desk in turn, carrying their plastic chairs. I watch another volunteer take blood pressure readings, and I step forward to invite the mothers onto scales so I can record their weight. At least I don’t need medical knowledge to fulfil that task. I forget to take a photo until the mid-wife is called away to attend a birth. She passes responsibility to a girl who does not shy away from the task. They are accustomed to having their photographs taken in Kabubbu, and welcome the chance to show their appreciation of the help they receive. Women spend all day at the ante-natal clinic, and I begin to understand their logic in carrying their own chairs. Orderly lines form outside separate areas as they sit in the sun and wait for blood tests, then counselling if necessary, or the nurse, and treatment. If this is a first visit of the patient, Dennis gives one-to-one counselling. With their permission, I sit in for one or two sessions. The counselling room is pleasant, airy, light and comfortable. All women are well advanced in their pregnancies. Dennis explains to me afterwards in English what they have talked about, but I can deduce their emotions from the body language. A very young woman enters the room. This is her first pregnancy, but her husband has made excuses. Dennis gives her a LINKUP card (for youths aged 10 – 24) which is a free pass for him for any illness, treatment or tests, as they want to catch the youths and start educating them early in good health practices. Another is expecting her fourth baby; this is her first visit and she’s six months pregnant. She is voluble when recounting her distrust of her husband, who refuses to come for AIDS testing. She thinks he’s off with other women. Dennis tells me some men fear the needle, others just don’t want to know; others say if their wives are okay, they must be okay. The final patient raises her voice halfway through the interview. She leans forward urgently, shaking her head, and despite Dennis’s calm responses, I can see that he is challenged. This one has been tested HIV positive, he tells me afterwards. Three months ago, she was negative. She is in denial (not unusual). He has refused her request for an immediate re-test, saying it is superfluous, as the result will be the same; so she is going to another clinic and will report back. No mother at the KDP Health Centre has passed the HIV/AIDS virus to their baby since 2011. This entry was posted in Charity and tagged AIDS, Counselling, HIV, Kabubbu, Kabubbu Development Project, Kampala, Makerere University, Quicken Trust, Uganda. Bookmark the permalink. Thank you for sharing Jane. I would imagine it would be very stretching and draining emotionally to work the clinics with AIDS very widespread. It is an amazing work for the mothers in Uganda! It is indeed, Carl. And it is not only mothers who are helped in this village. Keep reading every Friday!